The USC Fisher Museum of Art is proud to introduce JS Carson in his first museum presentation. 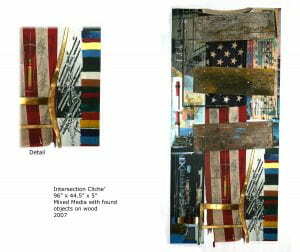 Fisher’s exhibition will feature a range of large mixed media works spanning the past decade revealing Carson’s talent. Born in Louisville, Kentucky, in 1971, JS Carson moved to Los Angeles in 1997. A self-taught artist, Carson is pursuing parallel careers in the visual arts and music as a drummer. The artist moved to Hollywood when he first landed in Los Angeles, and credits Hollywood–its unique fast paced urban feel and on the fringe, outlandish, and visually overwhelmingly busy environment–as a major influence on the development of his work. Carson’s art practice concentrates on photography based mixed media. His work ranges from large-scale mixed media and found objects collaged on wood panels to urban landscape paintings with photography. “I like to let the physical world in to my work,” says Carson. In his latest work the artist has developed a unique artistic process he terms “Painting with Photography”: using archival ink from a Canon inkjet printer, the artist conveys an image/ink to a wood panel, handmade paper, etc. using 8 ½” x 11″ sheets of acetate paper. Carson uses this process as a medium–as one would use paint for instance–to create a larger work by manipulating photos and using multiple printouts. His process does not involve starting with a computer or digital image and merely transferring it to a larger surface. Each work is built using individual photographs and sections of photographs much like a collage. A single resulting artwork might take hundreds of sheets of acetate to create. Carson likes this painstaking and meticulous process because of the organic urban decay feel it gives the work. The way I see it, the things most necessary to our daily life are frequently the most ordinary. On a given day we open doors, get in cars, trust metal pipes to carry every kind of fluid imaginable to us and see so many telephone poles that we have ceased to be able to actually ‘see’ telephone poles. All the true miracles of this increasingly technological age are built on these real world objects. For the past decade, I have been looking for ways to rearrange this background: take it apart, put it back together again and accentuate the extraordinary aspect of the mundane. In essence, I want to use images of what we take for granted and translate them into a new understanding of what it is to be a part of this particular time. So, my work is filled with things I actually use. The robot I photographed is my pencil sharpener. The Obama poster has been plastered to a wall I walk past every single day. The electrical plug was left over from a re-wiring job. All the found objects are part of my daily life. All the pictures are visuals that greet me on a daily basis. I repeat imagery in much the same way I find imagery repeated during the course of my day. We all keep looking down the long vista of the track for the same Metro train and it is the same set of constants every day. What changes is me. I never see it the same way. My eye transforms these scenes and my work is an attempt to register that change: hence, the delicacy of paper for an industrial image or a greatly enhanced scale mixed media assortment of ordinary objects. This synthesis of basic necessity, functionality, and my imagination is the engine for all my work and my window into the world. Hope you enjoy the view.